"Our buddy Gord." Gord Downie, 1964-2017.The best songs will always take one back to a particular point in their life's journey. So while The Tragically Hip long ago became Canada's Band, no subset of Canada took death of Gord Downie harder than people my age, Generation X and Xennials, who grew up in Kingston, Ontario. Some of that was the circumstances of where I was born and where I grew up, in the Kingston area as the 1980s ended and the '90s began. The Hip came along to offer something that was imbued with more brain cells than the hair metal that bounced off the walls of hockey dressing rooms before our games, but they were less nihilistic than grunge. And while we were a bunch of white kids embracing rap, the Hip reflected the better versions of our true selves, within the corner of the world we were born into. 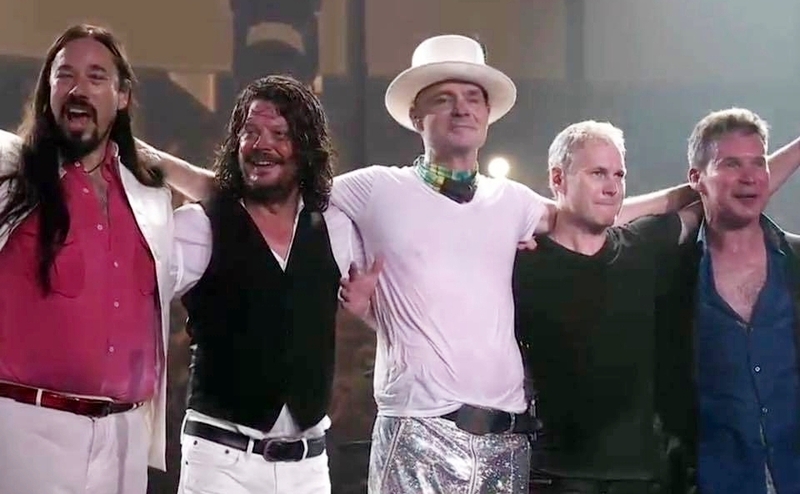 The particular, for me and not a few other people whom I grew up with, came from knowing that Gord Downie was an Amherstview boy had once sat in the same classrooms I sat in at Ernestown Secondary School and played minor hockey at the Henderson Arena when his family lived in Amherstview before moving "into town," Kingston. Gord belonged to Kingston, and the country and the world, but one aspect that should be covered off is that he had roots "out in the sticks" too. I was neither musical nor athletic, but I wanted to be in the creative class, so Gord was a beacon. He was doing it, so maybe I could to, in some genre. What I know now, of course, is that I wasn't a good athlete because I played scared. You can write scared; afraid of losing the reader, afraid of missing a deadline, that works in the short run. In the long run, though, you have to not be scared of making people feel uncomfortable or threatened by what you say. Of course, I know this because the Hip made a song about it. Playing scared always meant looking for some good-luck ritual. 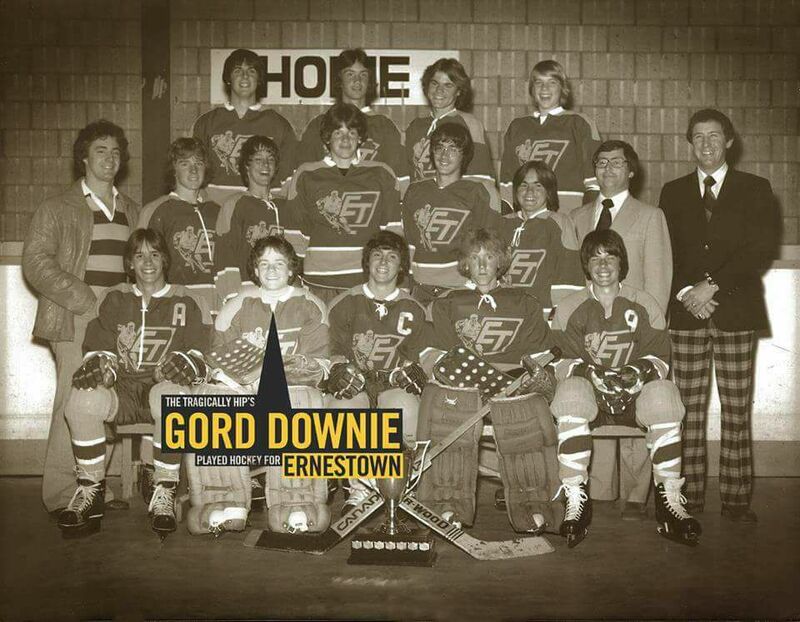 So from time to time, after dropping my duffel bag in the dressing rooms on the ground floor of Henderson Arena, I would go upstairs, look at that team photo and tap the glass in front of Gord's hockey-haired head. Then there was the connection through the high school, where I had some of the same teachers who had Gord in their classes when he briefly attended Ernestown. The death announcement alluded to the joy of getting to make music with friends he made in high school at Kingston Collegiate, but that stopover was enough for me to feel a connection. Ernestown could be labelled a small, rural school, but it wasn't to me. In the above-linked piece, the CBC broadcaster Martina Fitzgerald mentions how an Ernestown teacher named Judi Wyatt helped inculcate some literary curiosity in a young Gord Downie, circa 1978. A decade and half later, Judi helped come up with a self-directed learning program called The Gemini Project where students could pursue an interest with an outside mentor from the community. It was one of only two such programs of its kind in all of Ontario and, of course, it was 180 degrees removed from the current fetish for standardized literacy tests. I ended up staying in it for three school years and wrote a lot of stuff — 2½ novels, a lot of short stories, half a screenplay — that I would never show anyone again, but it pushed me in a positive direction. That was not because of Gord Downie. That owed to Ms. Wyatt, whom I remember once tandem-skydived on to school property after being challenged by her social studies students. I can make you scared, if you want me to. Point being, while today is full of sadness, personally it's a reminder of being fortunate to have grown up in a place that amid its white-bread homogeneity, had a relatively high amount of respect for the whole go-your-own-way independent thinker thing. In too many ways, our run-by-algorithms world has gone away from that in the quarter-century since I was 16 years old and listening to Fully Completely on a Walkman while writing a very bad first novel. That will come back someday, and we'll still have all the songs to guide us. Distant replays. If you want to know the Kingston I grew up in, it's pretty much captured perfectly by the video of Small Town Bringdown. That was filmed at a venue simply called The Manor. Don't look for it; it's not there anymore. It's probably my favourite Hip song, based on number of listens. Yer favourites: Bobcaygeon, Fireworks, Scared, The Wherewithal. Sidebar to #MeToo and #HowIWillChange. There #MeToo social media campaign has now reached its inevitable "will anything really change?" point. Any time that people realize their traumas are not that isolated or unusual is innately good. #MeToo also puts the onus on men to really ask themselves what they are doing to end intimate partner violence (the proper term for domestic violence that Julie S. Lalonde employs) and sexual harassment. Up until last week, I had the typical, "well, I don't harass, I can't imagine ever 'catcalling' someone on the street." But clearly that is not enough, based on what's going on in the world, so I have to be better, hence #HowIWillChange. Excusing bad behaviour through euphemisms is something to work on, for starters. One other side point is that the "THERE ARE BETTER WAYS TO DO IT" media trope needs to go like yesterday. And it's not limited to the get-off-my-lawn crowd or Twitter eggs with seven followers. Even progressive writers are prone to telling other people how they should call out social injustice. I'm not sure it helps. The Toronto Star picked up Polley's op-ed. Of course, in the print version it was given less prominence than a columnist criticizing #MeToo saying everyone needs to tweet less. You could say that any time, but why do you have to say it now? Oh, because at the end of the day you like the status quo better than what might await without it. It is a special kind of stunned to complain about a hashtag without offering something better. Like, duh. Vanier taking root? Ticket sales for the Vanier Cup have already surpassed 5,000. So the crowd is going to be better, at least, but whether Hamilton is the best venue is debatable. But U Sports is talking about keeping it there. And there is at least better marketing this time, with front-page ads in the Hamilton Spectator five weeks in advance. As in real estate, stadium ambiance depends on location, location, location. Having spent many a game day around TD Place in Ottawa, and having been at the 2016 Vanier at Tim Hortons Field in Hamilton, it's hard to see why the latter is the preferred venue for U Sports (apart from it being closer to the title sponsor ArcelorMittal Dofasco's offices). The thing about the Donut Box is it's just kind of there, plunked down in a residential neighbourhood with neither restaurants nor pubs within reasonable walking distance. It's not clear how that meshes with selling the sizzle. On further review, Department of Redundancy Department got it right: The Oct. 5 Montréal-Concordia game is not going to be replayed and no one will be awarded a forfeit victory. Bureaucrats 7, Lawyerball 0. And it just means no endgame shenanigans in the Laval-Montreal game. Winner gets first place. A G-L-O Glut. The most likely three-way tie in OUA's final standings could be Guelph, Laurier and Ottawa in a dead heat at 5-3. Guelph could stop overrated, overconfident and overly dependent on the ground game Carleton; Laurier is leaking oil heading into its Bye Bowl against McMaster; Ottawa has to go to Western and it's not in Western's nature to go easy in a nothing game. The common opponents are Carleton, McMaster, Waterloo and Western. The tiebreaker involves Guelph defeating Carleton, Laurier losing against McMaster and Ottawa losing against Western. Laurier is 2-1 with a +14 point differential (margin of victory for tiebreakers is capped at 33). Guelph so far is 1-2 and 23 points in the red. Ottawa is 1-2 and 10 points in the red, but also has a far tougher opponent. So really, the Golden Hawks' cushion is a 37-point advantage on the Gryphons, assuming I read the rules correctly (an X-factor if ever there was — Ed.). Ottawa would lose the tiebreaker. However that is only used to pick the first team. If it's Laurier or McMaster in third place with Ottawa and Guelph knotted at 5-3, then Ottawa finishes higher by virtue of the head-to-head. Ottawa kicker Lewis (The Leg) Ward goes into the game three field goals shy of the national career record. A bad scoreboard watcher. Out of my nine non-consecutive seasons as a a contributor to a broadcast crew, four involved a team put in position of needing to win the final game of the season in order to get into the playoffs. Four out of nine seems rather high. The bad news. Three of those teams — 1999 Queen's, 2012 and '15 Ottawa — failed to get in. No wonder my services as a play-by-player are not in demand; I'm a curse. The exception was three seasons ago. Ottawa defeated McMaster and got help from Queen's defeating Carleton. A better play-by-player was involved in that game, though, since Marshall Ferguson was quarterbacking McMaster. Make with the YAC yack. What is the good in a new official stat that is not necessarily accurate? As a sports-stat nerd, it is refreshing that the CFL includes yards-after-catch (YAC) in the receiving statistics. Why the other "FL" does not do that, and give the league leader the Jerry Rice Award, is baffling. Which one is better? Counting from the line of scrimmage is certainly tidier, and consistent with how rushing yards are calculated from where the play began, not where the rusher took a handoff. It also means one fewer data point that the league's on-site statisticians have to collect in real time. The two aren't the same, though, since a rush is credited to one player (exception: a downfield lateral, which is rare). Yards after catch is a stat within the whole play. There's right and there's righter, and Taylor is the latter in this writer's opinion. Commissioner's change of tune. One has to wonder what changed in three months to make CFL commissioner Randy Ambrosie change his tune on expansion talk. “I think we want to solidify all nine franchises,” Ambrosie said. “At the end of the day, when you build and you’ve got a really strong league, and really strong teams and everybody is doing well, that 10th franchise will find a way into the fold. Over a week into his new gig, Ambrosie made it clear that one of his goals is to improve the already successful state of the CFL. Toward that end, he sees four key components — Bigger. Stronger. Better. Faster. The moment that each of the nine teams fit the criteria required for that goal, the league can consider expansion more seriously. Ambrosie feels that as long as the CFL moves in the right direction, cities will line up. His vision of growing the game includes expansion, a subject that has been talked about for decades in the CFL with little progress. “Everybody wants to see a 10th team,” he said. “Everybody wants to see us have a partner out east and Halifax is the community everybody talks about. As I’ve said to the governors, it has to be done smart,” he continued. “It has to be a creative business model, where it’s financially positive to all. While not an 180-degree turn, that is more direct than the cocktail-party answer proffered in the summer. Halifax has nearly double the metropolitan population of Regina, but the Roughriders are the team of an entire province. It's also hard to see the Maritimes uniting as one the way Saskatchewan does with the 'Riders. Maritimers already have a regional football interest and it's called the New England Patriots. They tend to be tough to beat. Then again, give people something that feels like their own and a rooting interest can sprout up overnight. Who in Toronto gave any mind to Major League Soccer pre-Toronto FC? A great terrible football idea. The NFL tried and failed with a European wing (remember NFL Europa?) in the '90s and early aughts. Some say there were two deal-breakers. One, Europeans find American games ponderous and slow and two, the league's thought process with franchises was essentially putting teams in cosmopolitan cities the average American. Wild, half-baked notion: would three-down football export to Europe better, especially if there was hard-target market research to identify cities — the Hamiltons and Winnipegs of nations in western Europe — with football-friendly demographics? The seed took root in my addled brain around the time the CFL adopted a logo that gives less prominence to the Canadian maple leaf and also began streaming games on YouTube outside North America. Canada has long struggled with cultural exports — case in point: the band in my first two items — but one has to ask the question. There would probably have to be some Americanized modifications, such as 11-a-side, a 100-yard-long gridiron (that could be wider than the American 53.3) and no single point. It's doable though. Dr. Strangeglove, Or, How I Learned To Stop Worrying And Love Rob Manfred's Realignment Bomb. A solid working assumption is that Major League Baseball is planning to expand to 32 teams; it's just a matter of when. The should-read on the subject was the Baseball America piece from well-connected Tracy Ringolsby that laid out the plans: re-add Montreal, add Portland, re-align radically into four eight-team divisions and have expanded playoffs. It would mean an end to the league structure. Arguably, central and eastern Canada make out like bandits in this proposal. The Toronto Blue Jays would be in the North with Expos 2.0, Boston, both of the New Yorks, Cleveland, Detroit and Minnesota. That's five pre-built rivalries. Does anyone remember that Blue Jays-Tigers was a very good rivalry from 1984 till '93? And Expos Deux get better rivalries than the original team had, with Boston and Toronto competing for hearts and minds on the same turf. I expected to have a BUH TRADITION response ... and surprisingly, reacted oppositely. To most people of my vintage, having the "American League" and "National League" instead of two conferences is just semantic. Nobody in the demographics MLB is struggling to connect with gives a rip, either. Really, a West Division with eight teams that all play in the Pacific time zone (Arizona is Pacific time during the summer) is just a re-creation of the 1950s Pacific Coast League that was an autonomous minor league. So it actually makes historical sense.